It’s not enough for me that New York’s Metropolitan Museum of Art possesses Vermeer’s “Women With a Water Jug,” the Temple of Dendur and a large room full of armor. No, what I would like, truly, is to take pride in its cafeteria. That generic basement eatery could be anywhere, including a suburb in a declining Midwestern city. The posters that someone finally installed on its windowless walls have not improved the experience. A nook at the Met Museum public cafeteria. Photos invoke 1930s Hollywood, not the Greek and Roman wing. In the earlier public cafeteria space, art-lovers could munch on perfect medium-rare roast beef sandwiches in the aura of McKim, Mead and White’s marbled Roman atrium. That was taken over by the sublime Leon Levy and Shelby White Court of Classical Art. Since then, the cafeteria has been déclassé, despite the high prices. In fairness, a few years ago the Prado’s cafeteria seemed plain, but its gazpacho imparted a cultural experience that was the best of Madrid, the essence of Spain. The Musée d’Orsay in Paris should be an inspiration to the Met Museum. The food twice is good as Met fare, which makes it seem half the price (a friend paid $19 at the Met cafeteria for a plate of indifferent mashed potatoes and green beans, whereas I paid $23 at the full service d’Orsay brasserie for a large serving of smoked salmon, crudités and bottomless bread basket that I shared with a companion). Price is of course tangential to visual aesthetics. 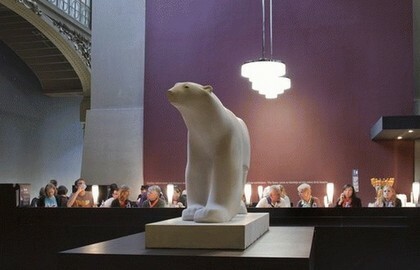 At the Musée d’Orsay, patrons at the snack bar, formally known as the Cafe de l’Ours, can enjoy a view of François Pompon’s delightful sculpture of an imposing polar bear. 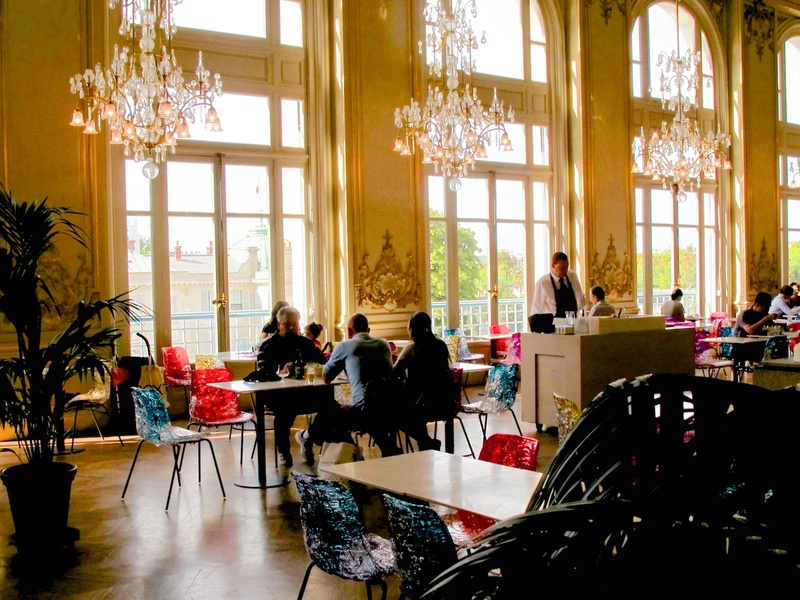 While the Bear Cafe is just right for many museum patrons, those who want a meal can go to the restaurant that was part of the original Hotel d’Orsay adjacent to the train station that became the Musée d’Orsay. And for those of us with appetites and budgets just in the middle, there is the Cafe Campana brasserie designed by the Campana Brothers of Brazil. 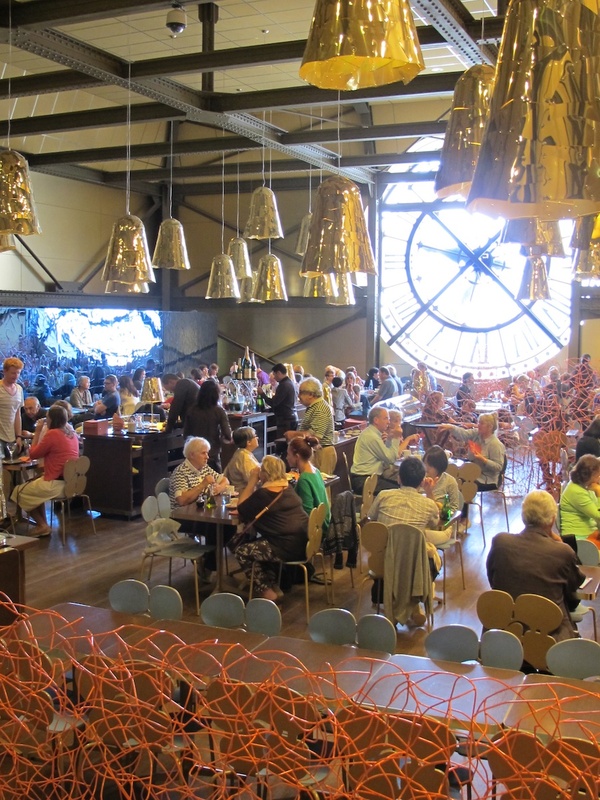 They also devised the set for Prokofiev’s Peter and the Wolf at the Guggenheim Museum in 2008.
Who could have a bad time at this brasserie designed by the Campana Brothers of Brazil with art piece room divider? 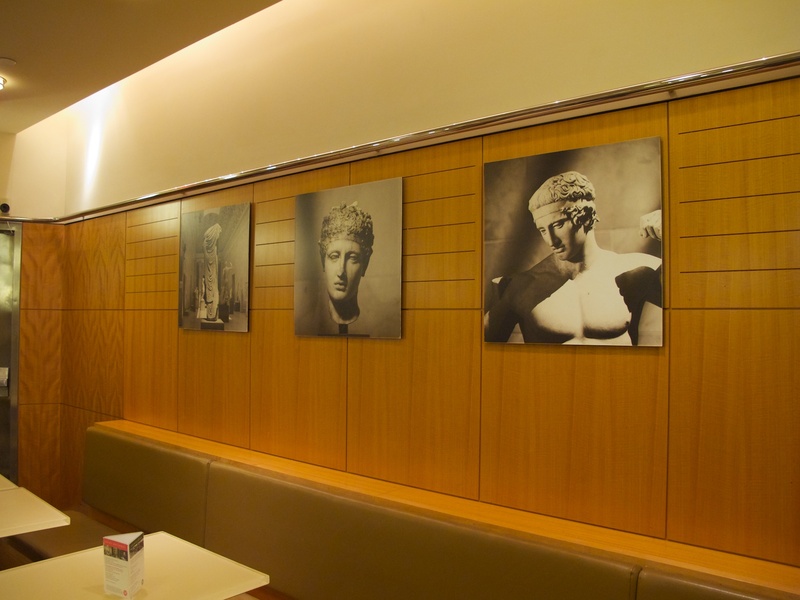 Providing a more imaginative experience at the Met Museum cafeteria could be monetized. Do as the French. Remember: Exit through the gift shop! 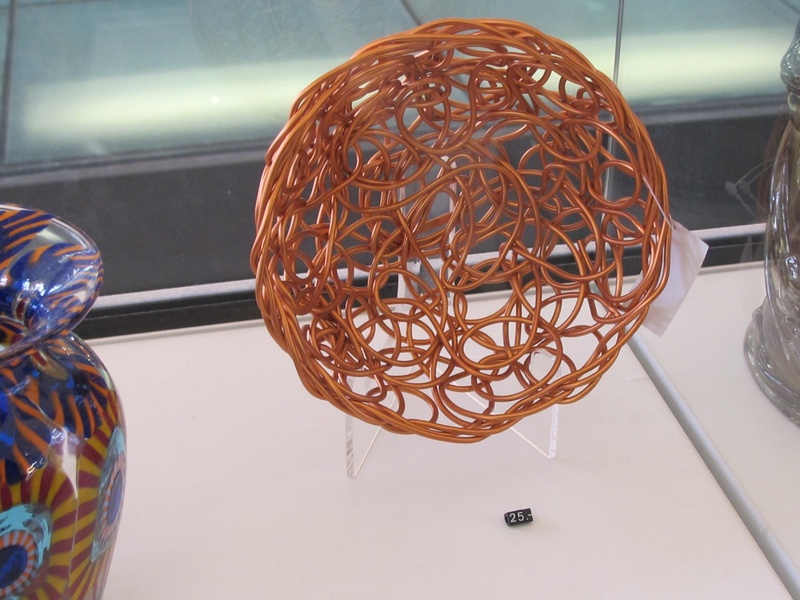 This entry was posted in New York City, Uncategorized and tagged gift shops, Metropolitan Museum of Art, Musee Dorsay, museums by Kathleen Brady. Bookmark the permalink. You’ve made me hungry for salmon crudities, whatever they are. The last thing you want in a museum is to feel closed in. Art is about space and atmosphere. So get a polar bear you MET execs and while you’re at it bring me some crudities. Any flavor will do. This critique of the Met’s cafeteria is spot on. It’s depressing and badly organized. As for atmosphere, there is none. Maybe David Koch has a few pennies left over from donating the new Met entrance that could be used to brighten up this dining area.